I recently found a chest of drawers that I wanted to do something with but wasn’t quite sure what. That got me thinking about the whole creative journey from idea to execution to finish. I want to take you on what is also an emotional journey, because it may be familiar to you (in which case it’s always good to share! ), and if it isn’t, it probably should be! How I visualise decorating a piece of furniture is as important for me as the actual decorative paint technique and finish I end up with. This chest of drawers had been ‘sitting there’, sort of staring at me for some time. I remembered the old adage (mine actually) that if you’re going to create an effect or finish, ‘allow the furniture to talk to you’ – because you have to be receptive to what the piece ‘wants’ [yes Annie communes with her furniture!]. Well let’s put it this way: if you try to impose something new on an old item like, “today I am going to paint a piece of furniture in a rococo style”, do you know what, it usually doesn’t work. So yes, it’s got to be a finish or effect you’ve been wanting to experiment with, but it’s also got to be something that works with that particular piece of furniture. This is especially true when you have a ‘difficult’ piece of furniture to paint, by which I mean you’re not sure which effect will work best, and/or the piece doesn’t present an obvious solution. And I do find some pieces can be ‘difficult’ – it’s not all plain sailing is it? And then there’s the fear of failure: this can have such a negative hold on creativity. Those creative talents (and we all have them) will flourish if you are able to be receptive to admitting something hasn’t worked out as you expected first time – and then changing it. When I came back to it, I noticed it actually had quite a nice texture, the wood itself on the top was old varnish that had crackled a little bit. I thought it would be quite nice to keep some of that crackling and texture, so I decided to try wash drawing – spreading with a brush over the broad surface evenly enough so that no brush marks would be visible in the finish. But when I looked at the finish it just didn't work for me. Then I had a bit of a brainwave: “Stripes” I thought. I added a lot of water to the tabletop so it became very wet (there was paint in the water which made it thin). 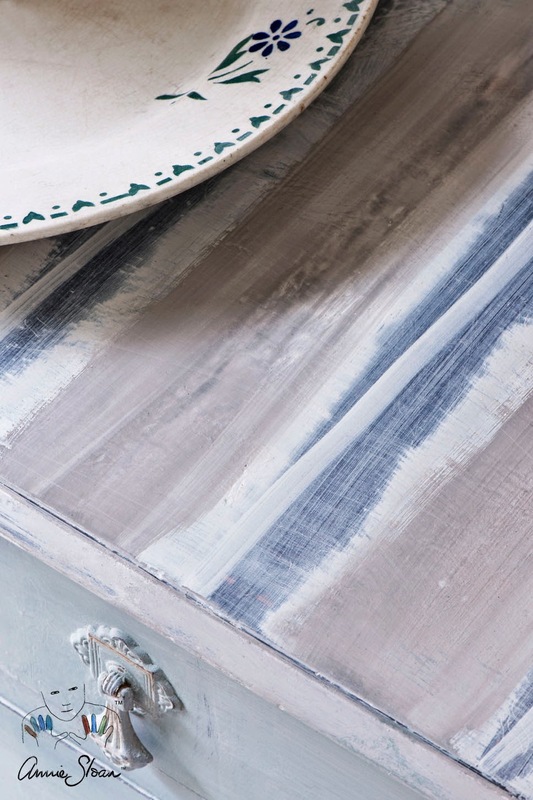 Using my paint, Chalk Paint® in Country Grey, I painted opaque stripes across the top with the full width of the brush. It started to blend in a little so I took a dry cloth and just gently wiped the paint down. So I have opaque-ish stripes, and thin, very water-coloury stripes. Then I thought “I know, I need a white line of opaque paint”. So I had three layers of stripes: grey, blue and white. I added some Old White with a smaller thin brush as solid paint. I then sanded the chest of drawers to give texture, followed by a wax finish. I love the way watercolour works – it can be applied in various techniques such as wet-on-wet and wet-on-dry to obtain different effects. And you get thick and thin together. Working with wet paint also means the colours blur together a little bit creating new and interesting effects. Try it! 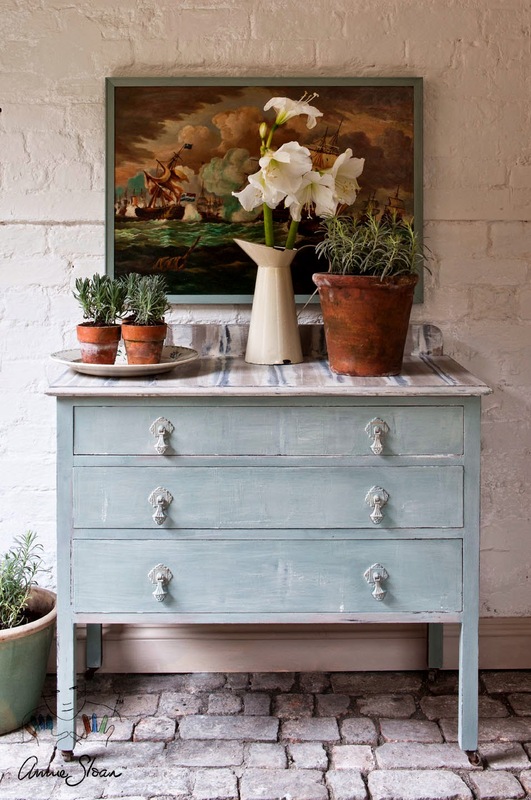 The resulting painterly effect reminds me of something you might find in Charleston House in East Sussex. Painterly? You ask. I’ve seen comments on my Facebook saying “is that even a word?” Well, yes, actually it is and it’s a word that painters and artists use a lot (and it appears to date back to c.1580s). To me it means ‘as an artist would paint’, and Merriam-Webster adds: “marked by an openness of form … and in which sharp outlines are lacking”. It also felt painterly because the painting of the sea, which I found in a bric-a-brac shop, complemented the effect. I also think it looks like a woven rug – with the textured paint strokes blurring into each other – and overall I am really thrilled with the finish.